Hooray! You and your family are expecting a bundle of joy! In just a few short months a lovely new baby will become the center of your world, and who in many ways will replace your furry baby. Dogs are emotional animals that need time to adjust to their new position in their now larger pack. We have all heard the stories of dogs that do not react well when the baby comes home. Some behaviors that come out are jealousy, over protectiveness, and uncontrollable excitement. You need not fear because I have some tips that will make this transition a much easier and a happy time. There will be many changes occurring in your household and with you during the pregnancy. Dogs are very in tune with hormones and moods; they will mirror you, your anxiety, your happiness etc. It is crucial during these months to prepare your dog for the baby’s arrival. 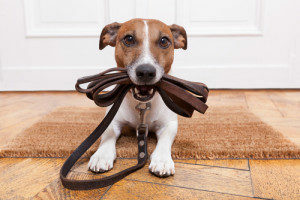 This means you will want to work out any unwanted behaviors your dog may currently have. The need of a professional trainer may be beneficial in teaching your dog voice commands, because let’s face it your hands will soon be full with the newborn. This is also the time to introduce and enforce any boundaries you may wish to have. If the nursery is to be off limits after the baby arrives, start well beforehand. 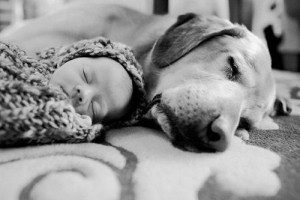 Besides making it easier on you later, your dog will be less likely to associate any restrictions with the baby. Nine months will fly by and before you know it your baby is here. Prior to bringing baby home, bring a burp cloth or blanket with the baby’s scent from the hospital and introduce it to the dog. Having a familiar scent later will help with the actual introduction to the baby. When you do arrive home with your baby, check your mood before opening the door. Your dog will be very excited when you come home and will feed off your emotions as well. It would be beneficial to calm your dog with a nice long walk ahead of time. Allow the dog to meet the baby on your terms, with the dog just being in the same room at first and then gradually allowing your dog to get closer. Doing this should create a harmonious introduction. Two things to remember: your child’s safety is always number 1, and don’t forget to give attention to your dog. Number 2, take the time while baby is napping to cuddle and play with your pup, reassuring him that he is still a cherished part of the family. Congratulations!